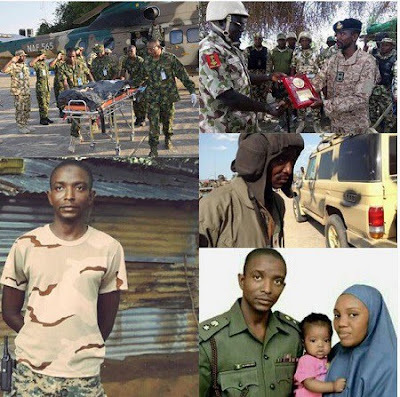 Lieutenant Colonel Muhammad Abu Ali, was the Commanding Officer of 272 Task Force Tank Battalion. Abu died at about 10.00pm on Friday when suspected insurgents attacked the 119 Battalion Nigerian army location at Mallam Fatori, northern Borno state. He left behind a wife and children. 2. Muhammed Abu Ali, one of the son of Colonel Abu Ali, who was governor of Bauchi state from August 1990 to January 1992 during the military regime of Ibrahim Babangida. 3. Ali led one of the army’s fiercest-ever battles with Boko Haram, in February 2015, culminating in the recapture of Baga town in Borno state. 4. The deceased was granted accelerated promotion from rank of major to lieutenant-colonel in September 2015, for his courageous performance in a series of the army’s engagements with Boko Haram. 5. A senior army official who spoke with newsmen on Sunday, November 6th, 2016 said Ali was close to leaving Mallam Fatori, where he was killed ahead of an army raid on Sambisa Forest.